I’ve still got “The Touch”! It’s Thursday and another beautiful Summer day. Thursday also finds me babysitting my now 5 yr old grandson. I had recently set up a box with lots of various stickers, stamps and paper to keep him busy. He decides that the paper looks like it could be his ‘grocery list’ so he starts deciding what he wants to put on it. “How do you spell Orange Juice?” (me) “O . . R . . A” (him): “Never mind – I’ll just put OJ, it means the same thing!” (told ya this kid is smart!) Next thing on his list is chocolate chip cookies (same ‘how do you spell that?’) (me: C..H..O etc.) (him) “Never mind-I put a W in it – I’ll remember what it means!” Oh, that kid! A little later we got into a discussion of what’s for dinner tonight. “We’re having Tacos!” (him) “I don’t think I LIKE tacos.” I then proceed to explain what they are and what’s inside them. “You can make mine without tomatoes – I don’t like tomatoes.” (I remembered that so I tell him he can put whatever he wants in them) “I think I’ll just put lettuce, cheese and hanga-bur” Yep, that’s my kid! Good old ‘hangabur’, can’t make tacos without it! I remember when my kids were little I made a list of various things they said or words that were uniquely their own, then put them in their baby book. I probably should start doing that for him, too. It’s always fun to look back on those memories and chuckle. A little earlier in the day it was looking like this might be a really short babysitting day, as his Dad was coming over around 2:30 to help his friend pick up our old van and, hopefully, get it started. Since we purchased the new one, his friend was very interested in our oldest (93) van and we need the parking space, so this was a good deal. Today was also youngest son’s work day as dishwasher for oldest son’s restaurant. Youngest just got a text that he doesn’t work today: “The restaurant’s flooded!” What a mess! Not sure just ‘when’ oldest will come to pick up grandson; it’s OK – we’re very flexible ‘free’ babysitters! I can’t imagine the mess and clean-up involved but, as Executive Chef, that’s all part of his job. He said the mess was mostly cleaned up but the carpets are still soaked – so glad that’s not my worry (or expense!). Right now I’m working on printing 55 copies of my special needs group newsletter; almost half done, then I’ll only have to staple them, fold and stuff the envelopes – then a trip to the Post Office and I’m done for another 2 months – YAY! cup (about 7 minutes). Discard vanilla bean; pour syrup over peaches. strawberry mixture and 1 teaspoon pistachios. Makes 4 servings. teaspoon and stir in after mixture is reduced. cheese; bake 5 more minutes or until cheese melts. Makes 8 servings. *2 1/2 pounds zucchini, sliced, may be substituted. place the teabags in. Let steep for 5 to 6 minutes. then pour into the pitcher, and stir until the sugar is dissolved. Fill the pitcher half way with ice, and stir until most of it melts. about 10 minutes, or until tender. Drain, and set aside to cool. mayonnaise, green onions, dill, mustard, lemon juice, and pepper. When the potatoes are cooled, stir into the bowl until coated. Arrange half of cucumber in a 9-inch pie plate. Top with half of onion. Repeat procedure with remaining cucumber and onion. stirring occasionally. Pour hot vinegar mixture over cucumber mixture. Cover and marinate in refrigerator 1 to 4 days. slotted spoon; arrange over tomato slices. Makes 8 servings. Blend mayonnaise, milk, lemon juice and tarragon; set aside. fold in grapes and cashews. whipped topping and set aside in cool place. to serve, cut with hot knife. Makes about 12 servings. thickened. Add chicken; heat through. Serve over chow mein noodles. crust is light golden brown. Let cool. and cool mixture to room temperature. Stir in sour cream and pour filling into pie shell. Cover with whipped cream. and remaining cheese. Yield:6 servings. 45 minutes. Uncover; bake 15 minutes longer. No Photos . . .
Today has been my ‘day of recovery’ from the long weekend. Saturday found me at “Log Cabin Days” joined by my lovely companions: June – who brings her wooden spinning loom and spins wool from her 26 sheep, and Kristie – who brings a large weaving loom (they have to transport it on a trailer!) and they both are great company. For a good three hours it was just the three of us, as none of my knit group joined me. Just around 2 p.m. one of our ladies came and a half hour later, another one. What, I quickly discovered, did I forget? Oh, the camera, of course! (Also forgot the table sign that said ‘who’ we were (of course, most people who visited our area just gave me one quick glance and then went to see what the other ladies were doing. Who’s going to look at a lone woman knitting on a picnic table? (There weren’t even the promised folding chairs! The other two ladies helped me lug a picnic table across the grass so I would have a place to sit). Day 2, Sunday found me going to Sunday School then leaving right after the choir sang. Got to the park only to find that, once again, no one from the group had come . . . sigh. The ladies & I kept each other company and I made friends with a very interesting man who used to be a teacher – he now comes to these events dressed as his grandfather who was a Cherokee Indian! His dress is very intricate and I asked him if he had someone create it for him: “No, it took me a year and a half to do all the beadwork myself. I created it after an old black & white photo of my grandfather. There’s still the trailing grapes & leaves to finish on the legs.” (I SHOULD have taken a picture! UGH!) He’s friends with the ‘settlers’ who are camped by him and they had fun during the day amusing each other. A few of the men would take their rifles and go up on the bridge; they’d shoot a rifle across the water (just wadding – no bullets or buckshot), then the Indian would come out with HIS rifle and yell: “Who’s hunting on my land?” Great fun. With about 1 1/2 hours til the end of the event, another lady who’s also friends with the settler families came to knit (she’ d joined them the night before and brought dessert over). The settlers, Indian and the Civil War encampment people all stay on the grounds in their tents for the 2 days. The weather was nice, chilly in the early morning but warming up – nice breeze (which gently wafted the wood smoke at me all the time – came home smelling of it BIG TIME). Met some new people, some of whom expressed interest in joining the knit group; saw about 6 people I knew the first day. The BEST PART was when a lady walked up and asked me if I knew a “Penny” – (me) “Well, I used to be called Penny when I was young” Turns out she was a good friend from Junior High School days – I pass her old family house regularly and always think: “There’s LouAnn’s house!” How funny! We had a great chat and I gave her my phone number – THAT made my day! I also forgot to print more business cards, so ran out of those towards the end of day 2 – ended up writing our website address on pieces of paper – it worked. We’ll see in the future how many of them follow through and join us to knit or crochet. One lady even wanted to PAY just to have us explain a particular stitch to her (and it was one I even knew!) of course, we just gave her the group card and told her to come join us at knit group! After the quick church morning and spending from around noon – 5 p.m. at the event, I ran home and grabbed the rest of the family to go celebrate our grandson’s 5th birthday. (I should inject here that the party had begun at 2, so everyone was pretty well in a tired mood when we got there). Grandson opened his presents from us and promptly ran off to play with the foam sword I got him (he got other things, too, but that was the only sword for the day – my son said: “Mom, that sword is a BIG hit!” I saw it in the grocery store and remembered my boys having something similar; they played with them until they were all bent up – boys LOVE swords! We ate, chatted then dragged home around 9 – I was just exhausted. It was a busy, but well-spent weekend. Thank heavens it only comes once a year! Using a LARGE fry pan, brown beef and drain. Add pepper and onion and cook to sweat the onions & peppers; remove from pan. Add about 4 T. margarine and about 2 T. cooking oil to pan – let it get hot. Pour both bags of Southern-style hash browns (the ones that look like little cubes) in pan, cover and cook on medium heat. You have to stir them about every 10 minutes to make sure they don’t stick or burn. (add more margarine or oil if you think it needs it) When the potatoes are all cooked, mix in the beef & gr pepper/onion mixture; stir well. Top mixture with shredded sharp Cheddar cheese and put under broiler until top is browned. I also season the mixture, after adding back the meat/onion/peppers with salt, pepper, garlic powder and a healthy dash (or 10) of Worchestershire sauce. Makes a large pan, feeds about 4-5 people. My husband labled it HIS comfort food. Well, friends, that about wraps it up on my ‘no photo’ weekend report. Maybe NEXT year I’ll do better – Sat. I forgot the camera/Sunday I remembered it but no one showed until it was almost too late! “Native American roaches (men’s dance headdresses. A roach is made of colored deer fur and porcupine guard hair, not the sharp quills. ” Thought you might find this interesting – I sure did! Here’s a photo of the 44 knit & crocheted dishcloths I delivered last night and there are more coming as the ladies are still working on them. I’m planning on taking enough ‘cotton yarn’ to work on more while I’m at the Log Cabin Days which is rapidly coming up tomorrow and Sunday. Our weather has been more like September than June lately, with grey, cloudy & sporadically rainy days. Today it’s 67 and I’m wearing long sleeves. Just checked the weather forecast for Sat./Sun and it’s high 80’s Sat. and 79 Sunday with a little clouds – sure hope it stays that way! (Last year we had to close the event about 1 1/2 hours early due to really nasty storms coming in). Since this is a mostly outdoors event, we really count on good weather to make it a great happening. There’s all sorts of local entertainment: a local concert orchestra (REALLY good! I LOVE hearing them play “Stars & Stripes Forever” and several John Phillip Sousa marches); a men’s barbershop quartet; several varied individual singers; a seniors clogging group (they’re OK – just not my idea of a great thing to watch but THEY have fun doing it and it’s good exercise, right?). There’s a man who runs an alpaca farm and he brings 2 alpaca; they’re in a small fenced in area but he takes them out for ‘walks’ several times a day to stretch their legs. It’s neat seeing them walking by on leashes. Lots to do and see and it’s free admission (only costs are for food and if you want to buy any of the many little items like hand carved wooden things (bowls, book ends, etc.) or hand made jewelry, used books, some antiques (dishes mostly) or some of the younger children’s fun things like face painting or fancy cord braiding. It’s a great event – I know I’m going to be tired out from all the ‘fresh air’ (certainly not from sitting in a chair knitting all day!). I’ll try to remember to bring my camera. Oh! We picked up the new van this morning (I haven’t driven it yet – my husband drove it home as I had another appointment coming up, in a not-the-best area of town to take in some paperwork to Social Security office). When I get done here I’m planning on going out to ‘add’ my own special ‘bling’ to MY van – my umbrella, the small hanging crystal beads that go under the rearview mirror, that kind of thing. In the sunlight today the color looks more medium grey than dark grey with flecks (and I didn’t SEE the flecks today! Musta been ‘star-struck’ the first time I saw it, eh?) Well, it WAS raining the other day . . . just sayin’ . . .
I’m off to go have fun with my new van – have a great day! This morning found my husband & I ‘car shopping’. I really didn’t know what I wanted, except that we’d decided it had to be a mini van 2008-2010. After visiting the dealership and finding out they had 20 of these, we sort of narrowed it down. 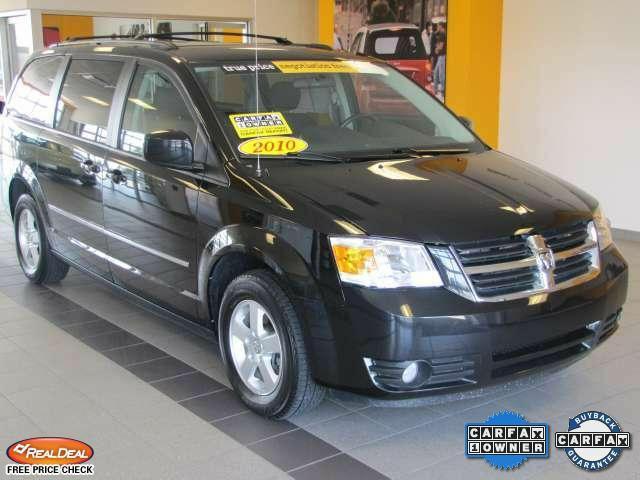 We ended up with a 2010 Dodge Grand Caravan SXT (what does that mean? I don’t know!) The ‘cool’ feature? The sliding side doors close themselves; it also has a deeper back storage area. The middle seats fold into the floor, also. There are other ‘great’ features my husband really liked: mileage was something like 25,000, something about Certified/ Warrantee/10 year something or other (see, I’m NOT a car person!) It’s in a color that’s new called Titanium (read that ‘sort of dark grey with a bit of sparkle – not exactly black/not exactly dark grey’) Interior is grey, also. It’s not as ‘fancy’ as I’d hoped, but for the price it’s great. * It’s newer than my old van (which is a 1997 and still runs pretty good for it’s age) and will fit the bill for keeping me cool in summer (my old van’s air conditioning died over a year ago), the heater works (almost ditto for old van) and should get us around just great. I thought it was funny – perhaps my face was showing a bit of my thoughts – the salesman asked if I wanted to take a test drive and I said OK; his comment was: “Well, don’t get all enthusiastic on me now!” (said jokingly, of course). It was all a bit too much ‘overkill’ – they all looked almost the same: same interior, same seats, same dashes (with a little variety in the clocks/radios), same body styling – almost all of them were either: white, black or grey – after looking in about 8 of them I got kind of bored and almost wanted to just go home and think about it some other day but then I realized that we REALLY needed to just get this car thing done, so I agreed to test the one we bought. We’ll probably be picking it up Monday (due to having to transfer funds from one account to another and waiting for the bank). One of my special needs guys said tonight: “So, this will be my last time riding in THIS van? Right?” (cute). Ought to be interesting . . .
*Had a few sort of ‘wish list’ features that I hoped we might be able to find, like the backup screen thingie, and/or the drop down TV screens, the back gate self closing thingie – but in the end, this will serve our needs well and in a price range we can afford. Today’s post might be viewed as a sort of ‘rant’, if you will along with the ‘usual stuff’. Sunday was Father’s Day and we took my husband out for Chinese food – good food. Monday evening we had decided we would celebrate my birthday (which had occurred Saturday without fanfare). It was mutually agreed upon by sons & husband that this dinner should be just my husband & I. We went to a local restaurant (Dobski’s); I had been there a few years ago with middle son for his company’s Christmas party and was impressed with the food. My husband had never visited this place, so it was a nice surprise for him. I had their “Sweet Turkey Reuben” and he had a Patty Melt; we both shared a potato skins appetizer and were pleasantly stuffed. This week has been more of the ‘get paperwork in order’ week; for part of the paperwork they required a copy of my Social Security Card (trust me, it’s all on the ‘up & up”). Mind you, I haven’t seen my SS card in many years – it might be in the safe deposit box at the bank (which is way too heavy for me to lift, let alone carry to a viewing room – another job for husband!). I decided to opt out and order a new card – oh, joy the fun of paperwork! Two of the questions on that lovely form were: What is your Fathers/Mothers SS number? How would I know – they’ve been dead respectively 53 and 42 years! (thank heavens there was a “don’t know” box for that one). Got it all filled out and took it to the Soc Secty office this morning – spoke to a very nice young man there. I should say that, later today, I received a phone call from another worker at that office concerning another SS issue, who (to this moment, which is a good 1 1/2 hours later) I’m STILL angry/upset/perturbed, fill in the blank at. First off, I couldn’t HEAR her (and repeatedly asked her to speak louder – NO, I’m not going deaf!). I tried changing phones which made it easier for ME to hear but then SHE complained she couldn’t hear me and would I immediately change back to the other phone. This ridiculous conversation went on for almost 45 minutes! It was a series of questions she was required to ask me but, in between my answers was TOTAL SILENCE! I kept asking her if she was still on! FRUSTRATING!!! (Boy, this really riled my hackles when I think of the many trainings we went through as telephone operators and how we were instructed to interject a ‘just a moment’ or ‘I’m still working on this’ in between spaces in a call. I guess the US GOVMT workers aren’t’ given that training, eh? By the end of the phone call I was ready to jump through that phone and scream at her (but I held my composure like a good girl). That call really shook me up; it’s very rare when I get that upset (or let someone ELSE get me upset like that). Still plowing through my ‘to do’ list for the day: laundry caught up “Check!”, dishwasher loaded & run “Check!”, house bills paid “Check!” Yesterday was our pick up from Purple Heart and that required me to get the 2 boxes and 1 bag organized. In the process I also ran into more ‘stuff’ which I suddenly realized would work well for the Log Cabin Days rummage sale, so yesterday was a big ‘boxing up unwanted’s’ day. In that process I also ran into a good 3 boxes of homeschooling books and materials. I was able to post them on Freecycle and they were picked up last night so the upstairs is slowly looking a little neater with all that ‘stuff’ gone. Yay! I’m finding, lately, that each day when I wake up I begin thinking of all the ‘to do’ things that still need finishing. There are still a few more ‘legal-type’ letters that need to be matched up with other paperwork and sent to their respective companies (all stock/bond stuff), have to get my act in gear soon and start comping up the special needs group newsletter for July/August or it will be here before I know it! (I’ll admit, some of my paperwork-type stuff I’m almost avoiding just because I don’t feel like going through all of it – it tends to really drag one down just trying to make sure you don’t make any mistakes!). Thursday is my grandson’s Fifth birthday and I was out today trying to figure out what to buy for a precocious, ‘smarter than his age’ boy – then remembered that KMart has all things “Cars 2” (the movie – his favorite!) on sale. He’s getting a pair of Cars 2 pajamas a pair of Sponge Bob Square Pants (his other favorite) pajamas, a Cars 2 t-shirt, a motorcycle-type t-shirt & shorts set, a “Penguins of Madagascar” t-shirt (another slightly less favorite) PLUS – I found a neat “paint it yourself” kit that has three animals (they look like plaster, but might be some sort of resin, instead): a lion, an elephant and a horse along with water-washable paints & brush. I think he’ll like them (already warned his dad I bought them – those are going to HIS house!). There might be a few other small presents thrown in at the last minute; I just found out through middle son that the birthday party isn’t until Sunday. (I won’t be able to make that, since I’ll still be at the Log Cabin Days until 5 p.m. – a previous commitment). We can probably swing by their house afterwards – we’ll see (the party this year is at his other grandparents house). Tonight is Knit Night and I’m more than ready for a little rest & relaxation (plus enjoying my ladies and their conversation/tips/projects/patterns, etc.). It’s been a crazy, rough, mixed up day and I’m feeling the need to PAR-TAY! The weather here has been a bit goofy – nice & sunny one moment, rainy & gloomy the next. While I was out earlier it was 72 degrees, dark & gray with light rain but REALLLLLY MUGGY! (Humid for those who don’t understand muggy). So glad we have air conditioning!!! mixture into each liner; press down. Bake for 5 minutes. Cool on a wire rack while you make up the brownie mix. half. Top each brownie top with 3 marshmallow halves. on them…they will burn fast if you turn your back. to 3 hours. Meanwhile, cook spaghetti according to pkg. with toasted French bread slices. Makes 8 servings. Place marinated chicken on clean lightly oiled broiler. of 165 degrees F. Slice chicken into 32 to 40 pieces. tortillas in the microwave for 14 seconds. In a hot cast iron dutch oven, cook the bacon until done. cheese and let cheese melt. dutch oven and add the chicken and an onion (chopped). Cook til the chicken is done. and remaining ingredients; toss well. top crust for the pie. all. Use pastry strips to form lattice top over fruit. to the US about 2-3 times a year). After reading my dear friend Mary’s (Momma) blog about her parents and especially about her Dad, I thought about my Dad. These are not easy memories to bring up, but here goes. I well-remember my Dad – he was my idol. Tall, strong handsome and I was “Daddy’s Little Girl”. Being an only child, it’s easy to see why I fit in that mold. I remember him mowing the lawn, making sure the grass underneath my swing set was taken care of so I could swing easily. Snuggling next to him on the couch watching Hockey Night in Canada (my cousin was on the team) and rooting for them to win (my Dad was from Paris, Ontario, Canada s0 there’s the connection). Visiting his relatives in Canada (a ‘day trip over the bridge’) and almost feeling like the ‘odd man out’ to my cousins because I had an ‘accent’! (Translate that as: “I didn’t say “eh?” or “Ooooooot” instead of out, or “Abooooooot” instead of about – that sort of thing – Oh! or calling cookies “Biscuits”) I remember being in grade school and being made fun of because when I recited my A,B,C’s I said: “W, X, Y, Zed” (Zed is the way Canadians say Z). As to the title of this blog, I well remember a year when Father’s Day fell on my birthday (June 18th) and I was royally angry – I wanted it to be MY day, not have to share it with my Father (pretty spoiled sounding, wouldn’t you say?) The sad part of growing up, for me, was that my father became ill when I was about 8 and went into hospital; he was there almost 2 years and in all that time I never was able to visit him. (back then hospital rules were different – young children were not allowed in hospital rooms). He died when I was 10 and I regret not being able to say goodbye. I was told that, at the time, he was in so much pain that he was ‘out of his mind’, so perhaps it was better I didn’t see my idol in that condition. My father had been a Meat Master (Canadian term-here we call them butchers). He came to Michigan for work and was working in a Meat store in town when my mother came in (I guess she knew another fellow who worked there). They met and the rest is history. My Dad was a quiet, gentle man who loved to take me to get ice cream cones, or let me tag along when he went to the store for milk or bread. My best friend once mentioned that she really liked my Dad because he would let her tag along on our ice cream trips. I well remember a memory of playing on the kitchen floor and my father telling me that when I grew up he would have to fight off young men who came courting me. (the memory was that I didn’t understand what he was talking about and he had to explain – I was probably around 6 at the time). Those are my memories – I resemble my father in looks – I have his square jaw, and even his cleft chin. Although it’s been 53 years since he died; I still have fond memories of my ‘idol’. Hoping you are either enjoying time with your Father or remembering something about your Father which brings you gladness. Today was a rather grey, rainy & gloomy day – not the kind of day you want to spend watching a 4 1/2 yr. old get more and more B-O-R-E-D! What to do? I was thinking last night about just what could we do, since now his pre-school is over and it’s summer. I took him on a mystery trip – we went to JoAnn Fabrics! Why, you might ask? 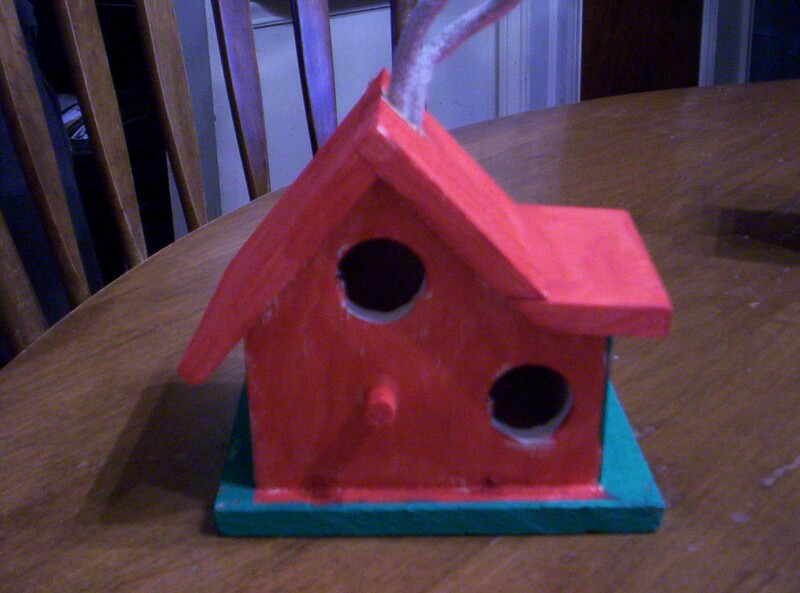 I remembered they had these little wooden bird houses for $1.00 that you could paint; there were about 5 different styles and he picked his favorite (I bought 3). 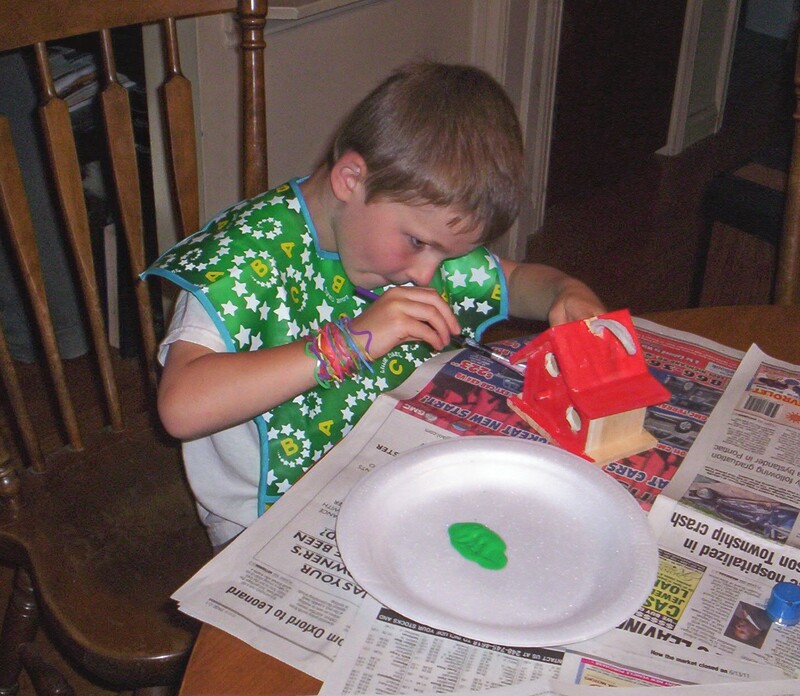 As you can see from the photo below, he was REALLY into painting! 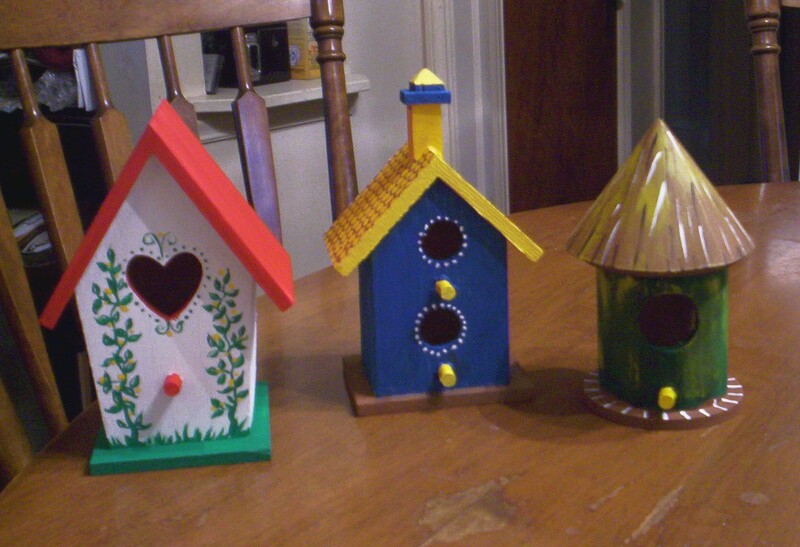 It was definitely a great idea – kept him busy, interested and using his skills to make something for someone else. He decided that he’s giving his to his Daddy later tonight. 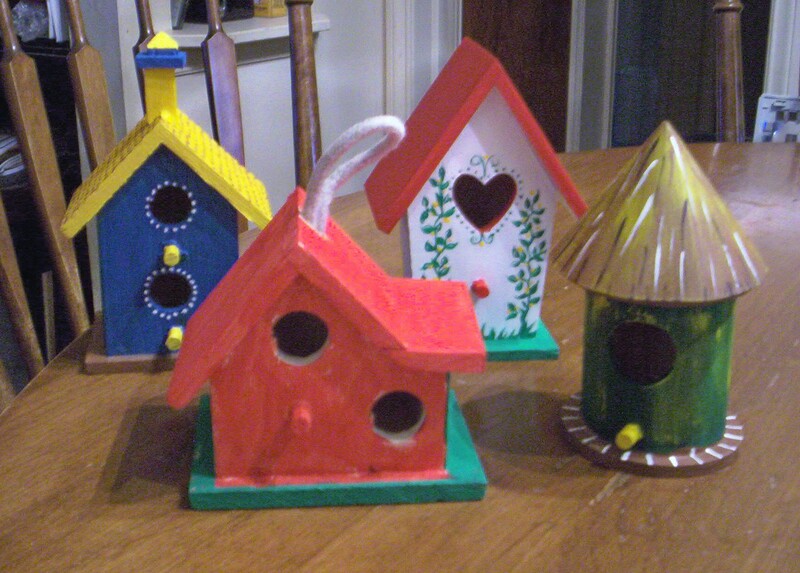 I painted mine with the idea of putting them on the window ledge outside, next to the other 6 or so that I bought at various garage sales. They’re just the right size and add a dash of color to the ledge. So, that’s what we did on this chilly, rainy Thursday! Hope you had a great day – no matter WHAT the weather threw at you! Happy Friday to you! It’s been a chilly, over-cast day with intermittent bursts of sunshine – just the perfect kind of day for getting things done – right? That’s what I thought, so I visited a local church garage sale! Went to the annual “Really BIG” church garage sale yesterday and a friend who works there commented: “What’s going on with you? Every time you come you buy LESS!” She’s right – for starters I don’t have to try to clothe three teenage boys, or buy toys for them and it seems with the change in economy there just isn’t as much or as nice a quality out there TO buy! Bought a few casual tops, 5 paperback mysteries, a small pair of earrings and two (circa 1950’s) knitting books – not much compared to many years ago when I’d get out the door with around $40-50 spent (spent a total of $5.40 yesterday!). Today’s trip produced a gold-mine of women’s clothing – all clothing 50 cents each! Found 4 light weight summer (church) skirts, a nice avocado green sweater set, a really nice forest green sweatshirt with embroidery on it, AND (SCORE!) a 1999 “Chutes & Ladders” game in great shape, to play with my grandson. Total of that purchase? $4.00!!! Not too shabby! Been dragging my feet a bit the past few days because youngest son has some sort of ‘bug’ which makes him blah feeling during the day and spiking 103 fevers at night. Kept him home from school yesterday but it seems he must have felt a bit better today because when I woke up to check on him (for the third time during the night) he’d already gone to school. (THIS is where the cell phone with texting REALLY comes in handy!) Was able to text him to see just how he was doing (ok-blah) and tell him to call me if he decided he wanted to come home: “DO NOT walk home!” He stuck it out and seems to be doing OK, we’ll see. It was like this yesterday, too – ok during the day, sick/fevers at night. He’s eaten two peanut butter & jelly sandwiches, so that’s good. The real test is tonight, again. (reason I’m tired? Been setting my alarm for every 2 1/2 hours to get up and check on him – makes me a little haggard the next day). Not much else going on – oldest came last night to pick up his son and told me he’s really sorry he won’t be here for Mother’s Day – he’s working putting together a huge Mother’s Day banquet at his work. 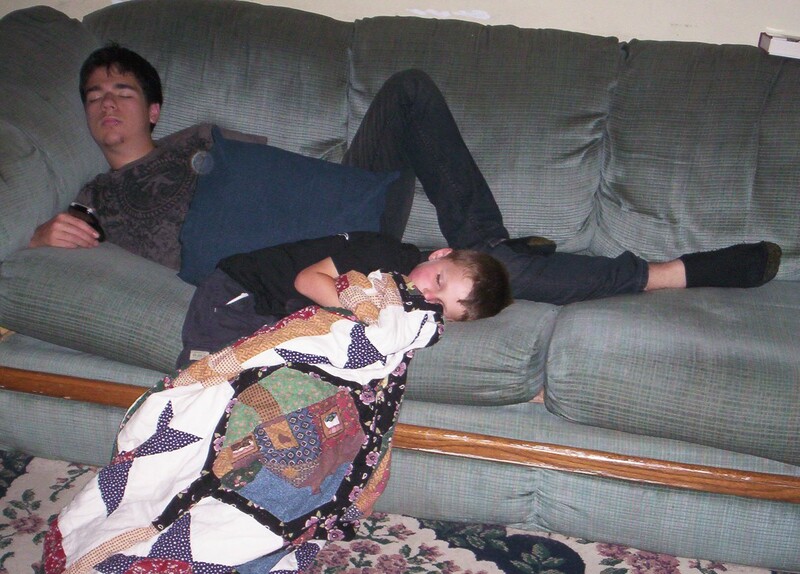 ALSO-youngest is supposed to be his dishwasher for Sat & Sunday – we’ll see whether he feels up to it – it’s a really nasty/stinky/rough and very tiring job – not sure it’s a good idea for him to even CONSIDER doing that, but he’s like the rest of my guys – VERY STUBBORN! He wants the money from the job and doesn’t care about his health to get it. Makes me crazy! I told him to let his brother know AHEAD of time if he can’t do the job, giving the brother the chance to call other people to fill the position for the night. Guess there’s a big 200-person party tomorrow and then Mother’s Day and all those dishes (glad it’s not ME!). Awaiting one more person’s vote on the Knit group moving back to our old place, Panera Bread. So far it’s pretty obvious what the majority wants: Move back to Panera: 12 votes, Stay at the church: 3 votes, Doesn’t Care either way: 8 votes. It really doesn’t matter to me much either way – at the church I have to get there early to unlock, make coffee, set out the snack supplies, organize the tables; at Panera I have to get there early to try to snag enough tables for the group, then re-arrange them and the chairs into a sort of elongated T-shape, put down our group signs, then wait for the people to show up (at end of meeting, put back tables & chairs – the ladies are usually pretty good about helping me with that part). The one good thing about us being at Panera? if I’m sick or can’t make it, the group can still go on with the meeting without needing me to do something (like unlock the church, etc.). Am planning on announcing the vote results this coming Tuesday; even thought I might just spring for some $5 pizzas, just for fun. I know that no matter how much I try – I won’t be able to please all of them . . . sigh. That’s my 5 cents worth for the day – hope you’re having a great day and that it’s sunny where you are! (Oh! We do have signs of Spring here – finally! Daffodils, Narcissus, hyacinth and grape hyacinth are all blooming. We’ve even had two huge rabbits frequenting the back yard – love seeing them hop around and nibble on our clover blossoms. 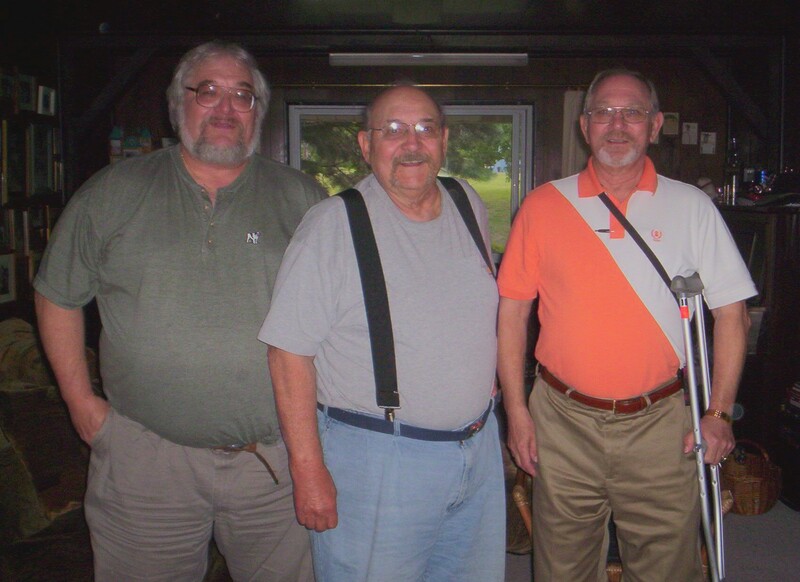 Last week I alluded to what was coming, now I can ‘tell ya’ – My husband was FINALLY able to see his older brother again. He hadn’t seen him since 1969 (long story, best left untold); you can also imagine – I’d never met him, either! We’ve been married going on 35 yrs and together for almost 36; I’d heard about him through the family, but by HIS choice, he decided he wanted to be absent and the family accepted that. 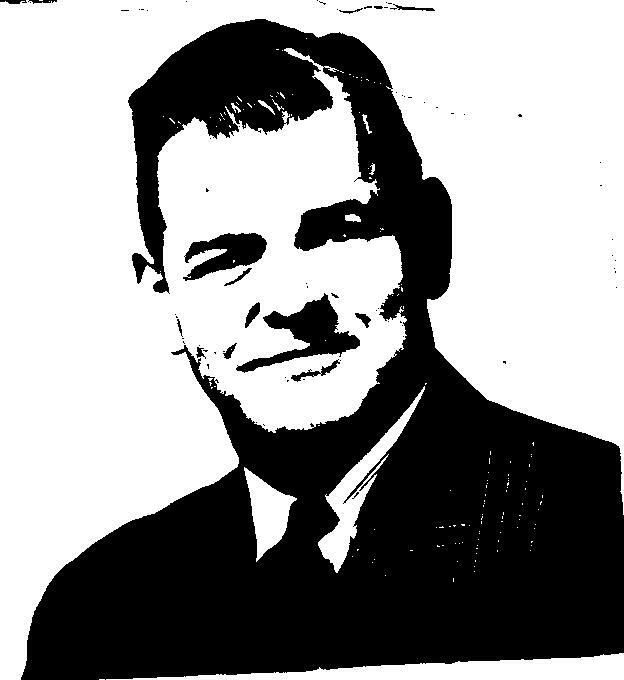 (to also add-he’d been in Special Services in covert ops and used that connection to sort of ‘disappear’). My brother in law (husband’s sisters husband) managed to locate him about 8 years ago and the sister got in contact with him, but he chose to remain ‘invisible’ to the rest of the family . . . until now. This past Saturday was his high school class 50th reunion and he came to town. My husband met him for lunch on Saturday and then, on Sunday we both went to a cousin’s house for lunch and I met him. It was a pleasant time together, we even walked to another cousin’s house around the block so that they could see him, also. It’s almost strange that THIS YEAR our life has taken several turns for the good – I probably shouldn’t say strange and more account for the fact that it is actually blessings in disguise. I was totally thrilled to see just how happy and ‘complete’ this visit made my husband. I can’t imagine going that many years not knowing how or where your older brother was. I was glad to see that he was finally able to reunite with him; I think it was a mutual happiness. Only three more days of school for youngest son, and those are only half-days; it’s finals week. Friday I have to take youngest to the doctor’s to x-ray his foot – it seems he & a friend were ‘play-kicking’ each other and he accidentally kicked the other kids kneecap which (we think) broke a bone in his foot. It’s a bone in the top of the foot just before you get to the baby toe; I SURE hope it’s not broken-this is the child who, last year, wouldn’t keep a cast on the broken bone in his hand! First time out he went swimming with the cast and it broke down (of course, due to water damage). Got it re-cast and he figured out a way to squeeze his hand out of the cast – that time I just gave up. (“It’s just FINE, MOM! My hand is JUST FINE!”) UGH! Kids! (Can’t wait to hear the doctor’s yelling at us because he injured it a WEEK ago but wouldn’t go to the doctor’s until finals were over . . . double UGH!) “It doesn’t hurt except when you push on it a certain way – I can walk on it just fine!” (big dark bruise at the site) Ah, the logic of teenagers . . . sigh. Spray bottom only of 13×9-inch pan with baking spray with flour. In large bowl, beat cake ingredients with electric mixer on low speed 30 seconds. Beat on medium speed 2 minutes, scraping bowl occasionally. Pour into pan. and forth to fill holes. (Some filling should remain on top of cake.) Refrigerate 1 hour. lime slices and lemon leaves. Store loosely covered in refrigerator. look for bottled Key lime juice near the other bottled lime juices. into dish, or sprinkle the potatoes lightly with paprika just before baking. serving with chopped peanuts and cilantro. It’s been a gorgeous summer weekend and, looking at this week’s forecast, we shouldn’t be getting any rain/thunderstorms until around Friday – that’s good! I love it when it’s nice out and you don’t have to even run the air conditioning, just open the windows and absorb all the SUMMER AIR!!! LOVIN’ IT”! Hope you are all enjoying your summer; don’t know about you, but to me it seems like we’ve sped through June already. What was that old expression about ‘funny how times flies when you’re having fun?” . . .
ps: Tomorrow is Flag Day – don’t forget to fly your flag! Today is one of those strange days that mix both good and bad elements. It started out a bit confusing (had to do lots of money-type paperwork) but got that cleared up and am feeling pretty good about all that got accomplished. Next came youngest son requesting to be driven to the bank to cash his work check, not a problem EXCEPT half way there the “Check Engine SOON” light came on and stayed on. Great . . . called husband and figured out that I could drop the car off at a near-by repair place and walk home. Bad part? Son had to be to work in a little over an hour AND it’s pouring rain. Well, we walked home in the rain OK (my hips were objecting a bit, but not too painfully). Got home a few minutes ago and called to confirm the car rental (had husband call while we were walking to get the paperwork started). Bad part, again? The car rental guy is expected here in a half hour to AN HOUR! That would put my son a good 1 1/2 hours LATE for work – but nothing else I can do about it. Oh well . . .I should also say that I’m really THANKFUL that (a) we made it home OK, (b) I’m healthy enough to be able to walk that far – about 3 city blocks, maybe a bit more (c) we can afford to get the car fixed and to rent a rental. The Lord is watching over us and I’m very glad! It’s the weekend coming up. Do you have any special plans? We have several ‘possible’ things going on but have to await phone calls to actually ‘plan’ them. 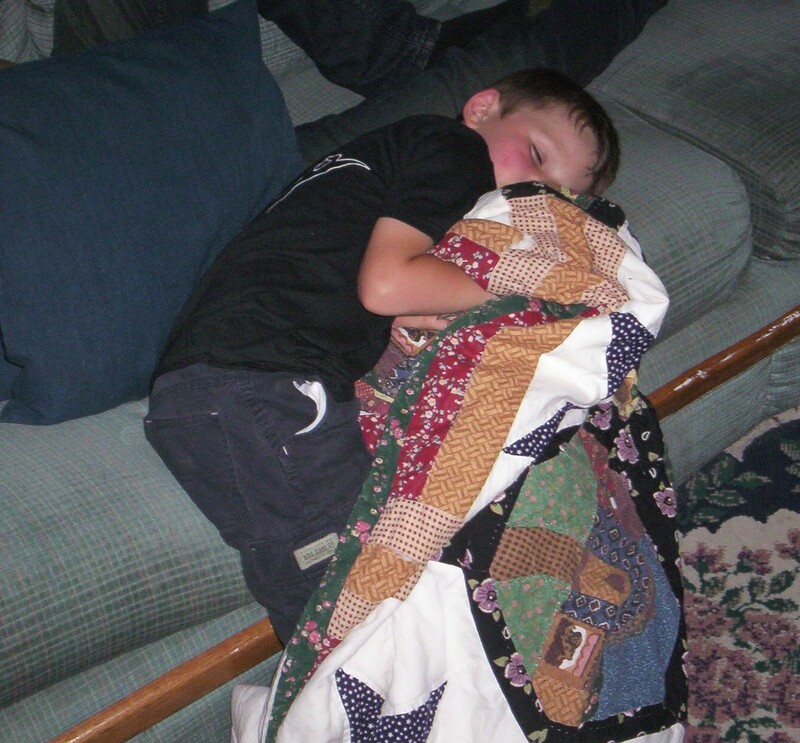 Yesterday was babysitting my grandson (see above photos) which turned out very easy – he took a long nap (a good 2 1/2 hours! 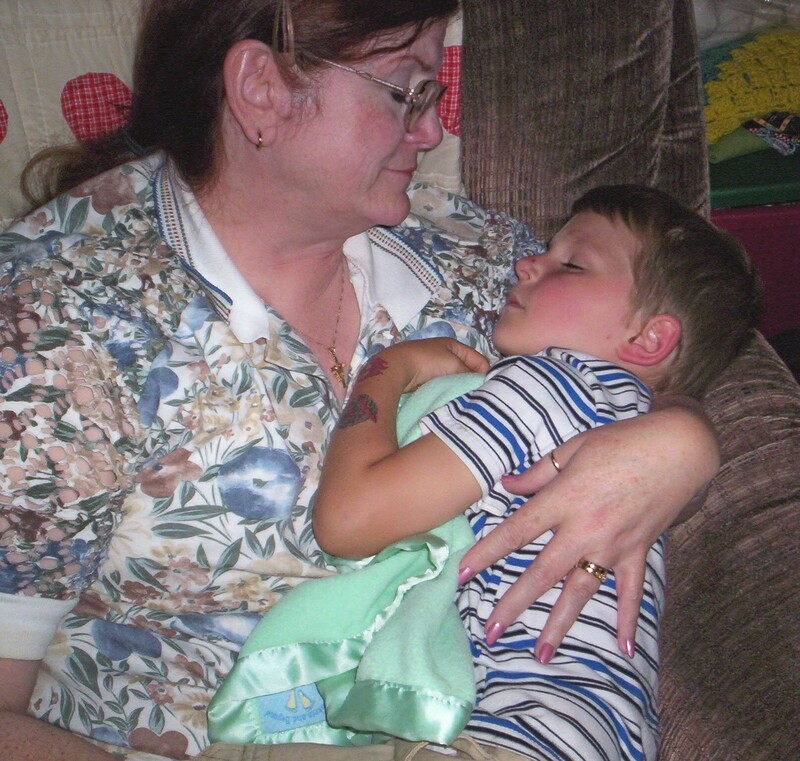 ), got up and ate dinner (ravioli & tossed salad) then his Dad got here to pick him up – no work for “Gumma” – Yay! He informed me that his Great Grandmother (on his mom’s side) is teaching him how to crochet – “but with only one of those stick-things (crochet hook). You’ll have to teach me how to do the 2-stick thing later, when I get more good at it, Ok, Gumma?” (he means knitting). I give the Great Grandma BIG credit for attempting to teach a very smart and very hyper 4 year old boy how to crochet! (I still love his term for my knitting: “Are you YARNING, Gumma?” On that note, I haven’t touched the knit dishclothes at all yesterday or today – will probably pick them up later tonight when things settle down a bit. (It sure feels good wearing DRY jeans & slippers – my shoes & bottoms of the jeans were totally soaked). Hey, the Lord made us Drip-Dry, didn’t He? a time, beating well after each addition. In a separate small bowl, combine 2 T.
flour and blueberries and toss well. beginning and ending with flour mixture. Fold in blueberry mixture and vanilla. clean,about 1 hour and 10 minutes. juice in small bowl. Drizzle over warm cake. Cut with a serrated knife and serve. the cooled blueberry and cream cheese batter. in the center comes out clean. Combine greens, tomato and croutons in a large salad bowl. NOTE from poster: "I don't always use the bacon"
(but add the almonds right before serving). May add more mayonnaise if needed. Cook 1 package cornbread mix using water instead of milk. "Everything will be OK in the end. If it's not OK, it's not the end!" say that our wiring harness was all chewed up - DARN SQUIRRELS! can use them! YAY, technology! (Old computer didn't have a USB port).